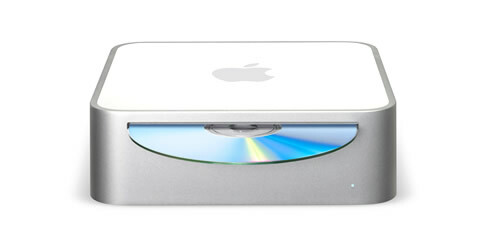 The Mac mini is beautiful as you’d expect, and acts as a great introduction to the world of Macintosh. Although it would seem that welcome isn’t too warm—I can’t help feeling that not including a keyboard and mouse is a little bit on the tight side. It’s no secret that Apple is aiming this sub-£400 product at the iPod user, impressed with the iPods design and ease of use and perhaps looking to move to Mac. They now have a viable upgrade path, and can keep hold of their monitor and other existing peripherals, yet I’m sure many of these potential customers will have systems that don’t use USB keyboards and mice and will have to purchase (perhaps budget) peripherals, thus diminishing the experience. There is no doubt in my mind that Apple’s product design is second to none—their hardware simply rocks—both in looks and functionality. But even Apple can’t be perfect and every now and again a design blunder is added into the mix. These almost exclusively occur within the realm of application interface design.